A very little person. A dwarf is a person whose size is much smaller than average. She is a dwarf, only three feet (one meter) tall. Some dwarfs used to be shown in circuses like strange animals. (fantasy) or (folklore) A race of small people, sometime with long beards. This is a type of fictional character found in legends all over the world, whose main characteristic is being much shorter than normal. In Scandinavian legends dwarves are considered as a true people, different from human beings. 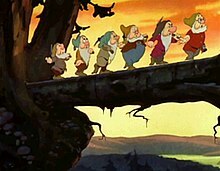 Snow white was adopted by seven dwarves. If something is dwarf is it smaller than normal. Anything of a much smaller than average size can be called dwarf.. I kept a dwarf tree in my house. Dwarf rabbits are quite popular pet rabbits. If X dwarfs Y, X is much bigger than Y. The elephant dwarfed the people with it. The new building will dwarf the old one. This page was last edited on 19 December 2018, at 11:33.